How to Find Interviews as a Podcast Guest, Talk Show, or Radio Interview Guest Expert - Free! - Radio Guest List.com - How to Get Radio Interviews and Find Podcast Guests! How to Find Interviews as a Podcast Guest, Talk Show, or Radio Interview Guest Expert - Free! How does the RadioGuestList.com free email leads service work? EXPERTS, AUTHORS & PR FIRMS - Get Free Interview Leads by Email: If you are an expert who would like to be interviewed by the media (or you are a PR professional representing authors, celebrities, musicians, or other experts), please sign up for our free emails here to help you get more publicity. Each day we have talk shows looking for guests, we'll email you "Guest Request" interview offers automatically and for free! Then you can email the hosts and producers directly to pitch yourself to appear on their shows. SHOW BOOKERS & PRODUCERS SUBMIT GUEST REQUESTS HERE FREE: If you are a Radio Show Booker, Podcaster, DJ, Talk Radio Show Host, or Television Producer who is looking for guests to interview, please visit our sister service at FindRadioGuests.com. You can submit your talk show booking guest requests there FREE. Then we'll post your Guest Requests back here on RadioGuestList.com and email our worldwide list of guest experts, authors, talent agents, publicists, and PR firms, too. With our free booking service the right interview guests for your show will soon see your Guest Request and email you directly - free! And, see our current Featured Guest Experts here now. They're great interview guests available for your interviews right away! ADVERTISE TO GET MORE INTERVIEWS FASTER: If you are an expert, musician, Author, celebrity, or marketer (or represent one), you can advertise with us and in our popular emails. MEDIA TRAINING: Learn how to use our free services to find radio interviews, podcast bookings, and other free publicity opportunities with our exclusive free "How To" tip articles and paid media training courses. See the free media training tips and our "How to Get Radio Interviews" course here now (and get a great deal!). About Us - the #1 Radio & Podcast Interview Booking Service! Since 2008, our free guest interview booking service for Radio Hosts and Podcast Producers has delivered thousands and thousands of TV and radio talk show interview guest opportunities and publicity leads from AM, FM, Syndicated, Drive-Time, Satellite, Podcast, and TV talk shows right to email inboxes like yours! 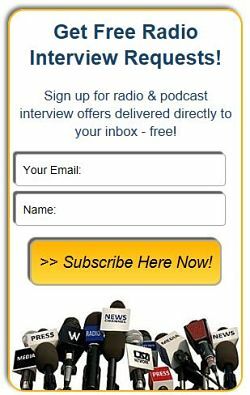 Join our FREE email list (or advertise with us here) to have top radio, podcast, TV talk show, Internet talk radio show hosts and producers email YOU when they're looking to find new guest experts to interview. in just 1 email each week? Or Guest Requests targeted to your specific publicity interests? Try our "Premium", "Digest" and "Alerts" Editions here for free! Please Click to Share News of our Free Service with Your Friends! RadioGuestList.com is fantastic for getting exposure for your product. In my case it's great books. I have secured many interviews since I subscribed AND an INCREASE IN SALES, too!! Bringing attention to my Web site at GoodShortBooks.com is easier with the help of RadioGuestList.com!! It is truly worth the small monthly investment!! I have enjoyed using this website and have successfully made contact and have a pending interview TBA. Great service and a no-brainer for anyone looking to get more media exposure in the form of radio and podcast interviews. I've had 15 interviews in 75 days, so I'm averaging one interview every 5 days! It's great to have hosts contact me instead of having to chase them down. I'll be a member for a long time! Thanks! Because of this free service, I'm the happiest author this morning being I just got the AOK for my 2nd interview. It introduced me to not just one, or two, but three radio stations that are perfect to share my book with. So thankful God's guided me to finding you. If this free version has done this, I'm excited to see what happens when I become a member! We have booked several quality podcast guests through this service. It makes my job as content marketing manager much easier! Within two days of being listed on this site, I had three interviews booked. Can't argue with those results! This excellent service is a huge bonanza for me. I have managed to promote all three of my novels on a multitude of radio stations, podcasts and blog radios throughout the country. So pleased to say that your company provides such a wonderful service! I have used the appropriate contacts on your site that correlate with my new award-winning book, and the radio interviews with the hosts have been great! Thank you! Great service, we use this to get podcast guests for me, nice work team!! Awesome! For sure I will be buying a round for you'll soon! I have more than I need and the choices just keeps piling in. Thank you so much for making my purpose so much more easier to achieve. This is an excellent place to meet amazing and wonderful people. Since joining the free email newsletter, I've been a guest on a millennial entrepreneur podcast making a great new connection, as well as was selected to be interviewed on a very popular podcast coming up in August 2017. Impressed with the free service, I plan to upgrade soon! During my first couple weeks as a subscriber, I found a podcast that sounded like a perfect fit. I sent them a message, and we now have an interview scheduled! Thank you for this great service. I look forward to finding more perfect fits. This is a great help to both parties. There are so many radio stations, hosts and experts in each and every topic. This is a platform in which all these have been made possible to connect and simply made work easier. Thank you so much for your service. I've not been getting your emails for very long but I have already connected with some great people that I would have never done otherwise. I am very grateful for what you do! Hey there, your site and services are unparalleled. I can't begin to describe the value of this website and the wonderful people from the creators of the site to the experts and guests themselves. I'm happy to report that RadioGuestList.com will be a show sponsor for TTR Unleashed on Friday nights on www.KGRAradio.com, The Planet. Thank you endlessly for these connections and services. We're gonna show some love and appreciation to you al beginning tonight at 6pm MST/8pm EST !!! I love this service! Since joining the Radio Guest List service I'm getting at least 1 or 2 interview requests a week and have completed 10 interviews in the past 5 weeks. I also joined the Business and Technology premium list and have received a number of responses when I submit a reply to a request for an interview. Keep up the good work, you have a client for life! You guys have created such a terrific service for my radio station. I have gotten some incredible and inspiring guests from here. You guys should be so proud of what you have created here. The service you provide is bringing people together in such a positive way I just started doing some live commercials on air for you because of the amazing job you do.